Kim Yo Jong was named as an alternate member of the politburo within the ruling Workers' Party of Korea, the opaque, all-powerful party organ where top state affairs are decided, the North's official media said on Sunday. Seoul: The promotion of North Korean leader Kim Jong Un's 28-year-old sister to the country's top decision-making body is a sign he is strengthening his position by drawing his most important people closer to the centre of power, experts and officials say. It makes her only the second woman in patriarchal North Korea to join the exclusive club after Kim Kyong Hui, who held powerful roles when her brother Kim Jong Il ruled the country. "Since she is a female, Kim Jong Un likely does not see her as a threat and a challenge to his leadership," said Moon Hong-sik, research fellow at the Institute for National Security Strategy. "As the saying goes 'blood is thicker than water,' Kim Jong Un thinks Kim Yo Jong can be trusted." Unlike her aunt, who was promoted to the politburo in 2012 after serving more than three decades in the party, Kim Yo Jong has risen to power at an unprecedented pace. Kim Kyong Hui has not been seen since her husband, Jang Song Thaek, once regarded as the number 2 leader in Pyongyang, was executed in 2013. South Korea's spy agency believes she is now in a secluded place near Pyongyang undergoing a treatment for an unidentified disease, according to an August briefing to parliament. Jang and his wife are not the only relatives to fall from Kim Jong Un's favour. Kim Jong Un's estranged half-brother, Kim Jong Nam, was killed with a toxic nerve agent at a Malaysian airport in February. Two women are on trial for the murder, which South Korean and US officials believe Kim Jong Un's regime was behind. Kim Jong Nam, who lived in exile in Macau, had criticized his family's dynastic rule and his brother had issued a standing order for his execution, according to some South Korean lawmakers. The smartly dressed Kim Yo Jong, her hair usually pulled back in a ponytail and mostly seen in black suits and black-heeled shoes, made her first debut on state media in December 2011, seen standing tearfully next to Kim Jong Un at the funeral of their father. Since then, Kim has made several appearances with her brother, giggling at concerts, riding a white horse, smiling as she receives flowers on his behalf at state functions. Her youth and bubbly personality seen in state media are in stark contrast to the usually glum generals and ageing party cadres who follow Kim Jong Un on official duties. Having previously only occasionally appeared in the background, the young heiress has moved to the front and centre of media photos more recently, assisting her brother at numerous high-profile state events. 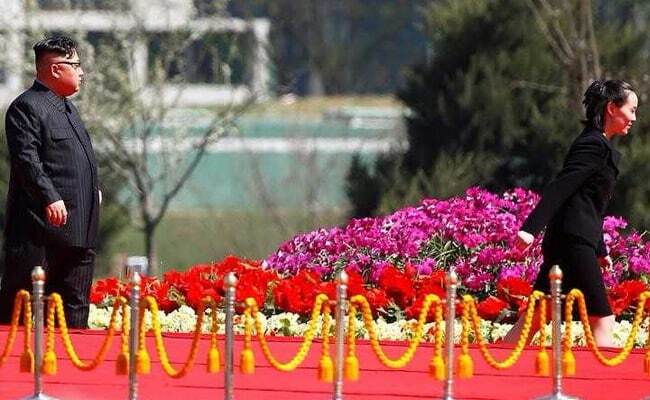 At a massive military parade in April to mark the 105th birth anniversary of founding father Kim Il Sung, she was seen rushing out from behind pillars to bring paperwork to her brother as he prepared to give an address. The same month, she stood alongside him during the unveiling ceremony of a construction project in Pyongyang. In March 2016, she accompanied Kim Jong Un to a field guidance for nuclear scientists, where he claimed successful miniaturisation of nuclear warheads. "Kim Yo Jong's official inclusion in the 30-strong exclusive club of North Korea's chief policy makers means her role within the regime will be expanded further," Cheong Seong-chang, senior fellow at the Sejong Institute south of Seoul. Apart from her age, little is known about Kim Yo Jong. In February 2011, South Korean TV station KBS showed a woman it identified as Kim Yo Jong and her other brother, Kim Jong Chol, enjoying an Eric Clapton concert in Singapore. However, a Reuters review of those pictures shows it was most likely a different person. The three, who all reportedly went to school in Switzerland, are full blood siblings, born to Kim Jong Il's fourth partner, Ko Yong Hui. Kim Jong Chol, the oldest of Kim Jong Il's sons, does not involve himself in politics, leading a quiet life in Pyongyang where he plays guitar in a band, according to Thae Yong Ho, North Korea's former deputy ambassador in London who defected to the South. In 2014, Kim Yo Jong was made vice director of the Workers' Party's Propaganda and Agitation Department, which handles ideological messaging through the media, arts and culture. The position led the U.S. Treasury Department to blacklist her along with six other North Korean officials in January for "severe human rights abuses" and censorship that concealed the regime's "inhumane and oppressive behavior". Last year, South Korea's former spy chief said Kim Yo Jong was seen "abusing power", punishing propaganda department executives for "minor mistakes". In a North Korean state media photo in January 2015, she was spotted wearing a ring on her fourth finger during a visit to a child care centre. South Korean intelligence officials say Kim might have wed a schoolmate from the prestigious Kim Il Sung University, but there has been no confirmation of whether she is indeed married or to whom.